Q: Why does the design look solid and not complete? A: In order to launch the campaign by the deadline, Custom Ink needs time to add the names and prepare the design for each shirt. Once the design is finalized, it will be updated on the thumbnail. Q: How long will the shirts be available to order? A: Shirts are available to order during specific times that are outlined in the emails, texts and social media posts. Shirts are available for two runs, the first run spanning from December to January and the second run from March to April. Please keep in mind that the second run will not be delivered before International Childhood Cancer Day on February 15th. Q: I forgot to submit a child’s name! Is it too late? A: Name submissions close after the name submission period ends, but we accept names for the next Awareness Shirt continuously. To submit a name, please Click Here to add a name to our next Awareness Shirt. Also, be sure to opt-in to our email list and follow us on social media for updates on these campaigns and others. Q: I want to submit a name for all of ACCO’s awareness shirt campaigns. Can I be put on a continuing list from year to year? A: Yes! When you submit a name, please add “yes” in the field next to the question “Would you like the name you submitted to be carried over to all following campaigns?”. When you do this, the name will be added ongoing unless you request for us to discontinue. Q: I accidentally spelled my child’s name wrong! How can I fix it and how will I know it was fixed? A: Names are listed in alphabetical order by last name or last initial. If you find that the name you submitted was spelled incorrectly or there is another edit required, please submit your request during the open verification period as specified in the emails, texts and social media posts. During that time, to request an edit, please use specified column on the Name List. It is important that you type the name exactly as you’d like it to show on the shirt for your edit request. Edits are made only during the specified period and are completed as soon as they are received if submitted during the specified time period (usually the last week in December). If you have any questions about edits, please email us at shirts@acco.org. Q: What is the “grouped name” request? If siblings, cousins or friends have fought childhood cancer want to be next to each other on the shirts, the grouped names option makes this available.All names added to the awareness shirts are only for children or teens who have fought or are still fighting childhood cancer, and not simply for siblings, family members or friends that have not fought cancer. Thank you in advance for your understanding. Q: I don’t see my name submission on the design thumbnail? A: Names used for the design thumbnail are not the names from the actual list. The final list will be loaded to the design by January 22nd. Q: How do I know which shirt number to select? A: Simply go to the collection page here. Look for the shirt number that has the name you submitted, by last name. Then select that shirt, select the style, size, quantity and then place your order. Q: When will I receive my ordered shirt? A: Shirts ship only after the campaign ends and usually require approximately two weeks for delivery. Our goal is to have the shirts from the first run delivered to everyone by February 15th – International Childhood Cancer Day, for you to wear to help raise awareness. Q: Is this shirt available internationally? Q: How can I help raise awareness with this shirt? 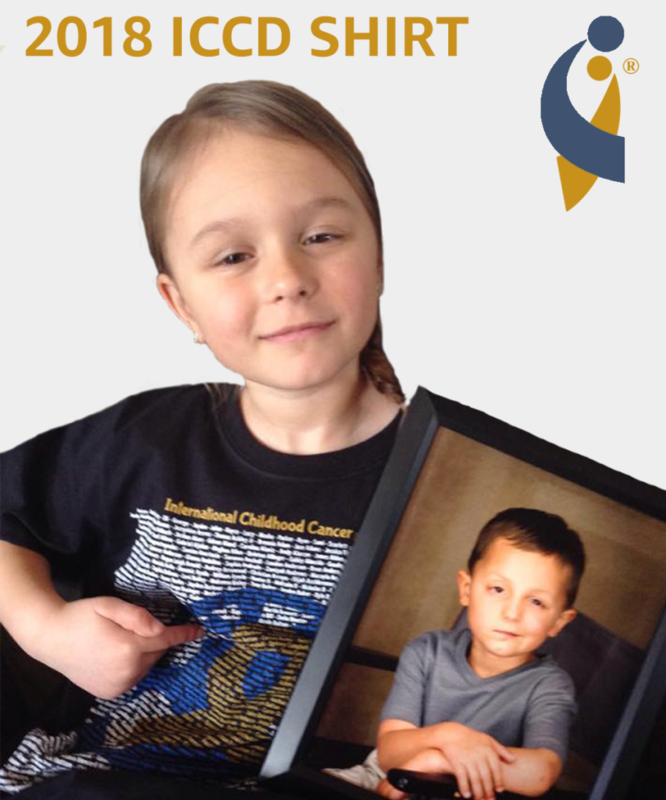 A: Wear your shirt on International Childhood Cancer Day, take a photo and email it to shirts@acco.org or share on our Facebook Page! We’d love to add your photo to the ICCD Awareness album on social media and to our website gallery.